Modern archives (census returns, civil registration, etc.) 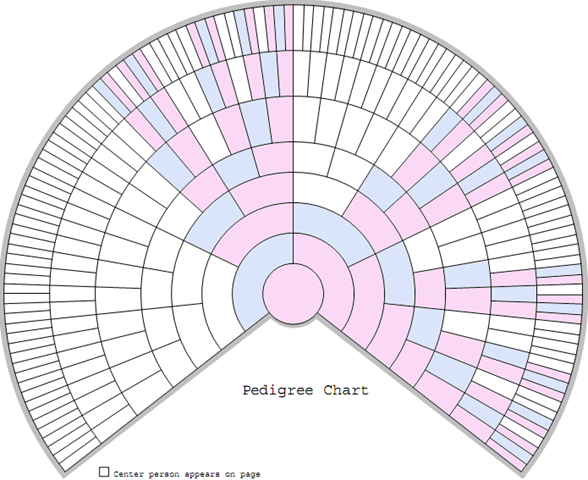 are used by genealogists to verify the oral family traditions passed down from their older relatives. The ancient annals of Ireland contain details of the original bearers of many surnames and the relationships between them, but are they just unverified traditions passed down orally for many centuries before they were committed to writing? All surname groups are now using DNA for family research and for verification (or refutation) of the annals. represented by strings of the letters A, C, G and T.
Where does our Human DNA come from? Y DNA from males is widely used for one name studies or surname projects such as the O'Dea/O'Day/Dee DNA Project or geographical projects such as the Clare Roots Project hosted by FamilyTreeDNA.com. Autosomal DNA comparison is heavily marketed to males and females by several companies including AncestryDNA. Targeted mitochondrial DNA comparisons can be used to address more specialised problems - e.g. did two women have the same mother? or just come from the same female line? Targeted X DNA comparisons can also be used to solve more specialised problems - e.g. did two men have the same mother? As this is a Clans and Surnames event, this talk will concentrate on Y DNA, which is associated with surnames. Most DNA is transcribed exactly from the relevant parent to the child. Mutations are transcription errors at single locations, e.g. a single A in the parent may be replaced by a C in the child. FamilyTreeDNA will (for a fee) examine your Y chromosome (if you have one) for both STR and SNP mutations. STR mutations can reverse or repeat in later generations, but some SNP mutations on the Y chromosome are once-in-the-history-of-mankind events. These mutations have occurred exactly once. Every man descended from the man in whom the mutation originally occurred inherits the mutation. No other man has the mutation. When discovered, each of these SNPs is given a label consisting of letters followed by numbers, occasionally including an underscore (_), e.g. L226 or FGC5660 or ZZ33_1. Men with a more recent SNP may share older SNPs with men who don't have the recent one. Note that surname spellings also mutate, independently of DNA mutations, e.g. Ó Deaghaidh to O'Dea to O'Day. If you want to be found, then you must let your potential cousins see your DNA results and the relevant part of your known family tree (i.e. the.ancestors from whom you may have inherited your DNA). Do you want your descendants cursing you in perpetuity for trying to hide from them? If there was a mass murderer in your extended family, would you object to your DNA being used to take him off the streets? The entry-level Y-DNA product is now Y-DNA37, which looks at the numbers of repeats for each of 37 STR markers on the Y chromosome, e.g. the Clare Roots Project. FTDNA customers may want to turn off usually irrelevant Y-12 and Y-25 match notification e-mails on the Notification Preferences page. a predicted haplogroup or terminal SNP. as the science of analysing the Y chromosome has evolved, a haplogroup has come to refer to a group of men with the same SNP mutation. 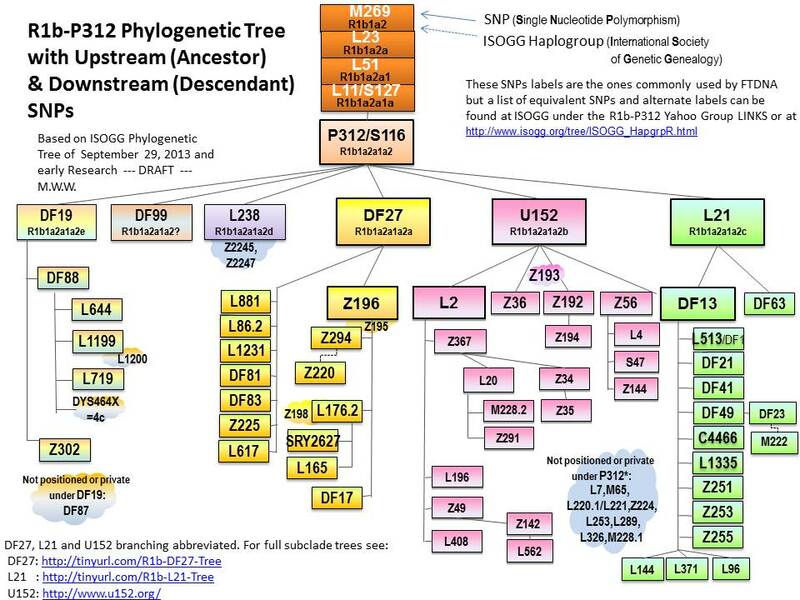 SNPs can be used to build a Y-DNA Haplogroup Tree or haplotree, with more recent SNPs shown as children of older SNPs. There has been a SNP Tsunami in recent years: from about 800 SNPs in 2012 to more than 35,000 SNPs by 2015. 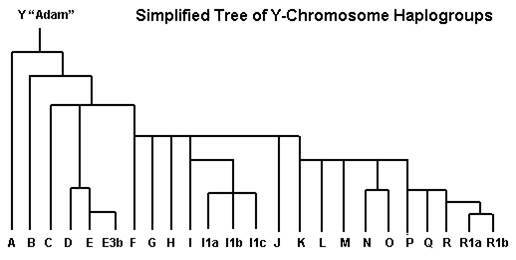 The Y chromosome is only 59,373,566 letters long, so there is an upper bound to the number of SNPs that may eventually be discovered. Men with the same SNP mutation tend to also have similar patterns of STR mutations, so STR mutations are used to predict SNP mutations. FTDNA now uses "haplogroup" (on the Y-DNA Colorized Chart) interchangeably with "Terminal SNP" (on the Y-DNA - Matches page). Project administrators can usually, if less confidently, predict more recent SNP mutations and can group members into predicted haplogroups with their closest relatives on the project results page. Known relatives should pool their funds to purchase more advanced testing or donate to relevant projects, rather than waste money merely confirming known relationships. Donations to FTDNA projects must be used to purchase FTDNA products for members and can not be used for any other purpose. Sometimes the Irish annals tell us that certain groups of surnames can be expected to have similar Y-DNA signatures. Sometimes Y-DNA results tell us that certain groups of surnames are closely related. Sometimes Y-DNA results tell us that common surnames have multiple independent origins. 91. Cas: the elder son; a quo the Dal Cais or "Dalcassians;" b. 347. Had twelve sons:—1. Blad, 2. Caisin, 3. Lughaidh, 4. Seana, 5. Aengus Cinathrach, 6. Carthann Fionn, 7. Cainioch, 8. Aengus Cinaithin, 9. Aodh, 10. Nae, 11. Loisgeann, and 12. Dealbheath. Families descended from Cas include MacArthur, O'Beollan (or "Boland"), O'Brien, O’Brennan, O'Casey, MacConsidine, O'Cormacan, Cosgrave, MacCraith, (or MacGrath), O'Curry, Eustace, Glinn, Glynn, Hearne, O'Hogan, O'Hurley, O'Kelleher, O'Kennedy, Magan, Maglin, MacMahon, O'Meara, Muldowney (now "Downey"), O'Noonan, Power, Quirk, O'Regan, Scanlan, O'Seasnain, and Twomey. Genetic similarities have been found in the last decade between men with these related Dalcassian surnames. They generally have Irish Type III DNA characterised by the L226 SNP in Haplogroup R.
There is a project set up at Family Tree DNA for the R-L226 Haplogroup. 18.2% (70/385) of the men with Y-DNA results in the Clare Roots project are confirmed or predicted L226+. Surname-specific SNPs are now being discovered for the main Dalcassian surnames and will eventually be discovered for all common surnames. 7.5% (29/385) of the men with Y-DNA results in the Clare Roots project are confirmed or predicted L226+. 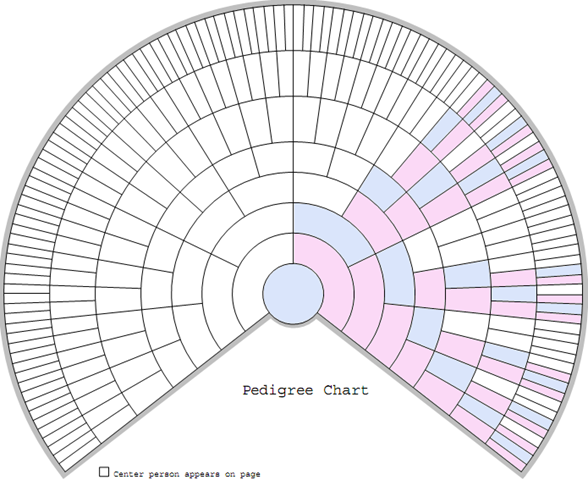 The O'Loughlins were one of the two most powerful families of Corcomroe: see pedigree. According to Cairney, "The chief families of the Corca Modhruadh were the O’Connors, MacCurtins, O’Loghlens, O’Davorens and the Corca Thine." Davoren and O'Loughlin are prominent surnames in this Y-DNA grouping, so it probably includes the descendants of the Corca Modhruadh. L1336 has also been referred to as the "Clans of North Clare" SNP. yfull.com has no estimate of the age of L1336. Within the Clancy Surname (DNA) Project (3,650 in 1911), there are eight independent genetic origins. Within the O'Dea/O'Day/Dee (DNA) Project (1,318 in 1911), there are about 16 independent genetic origins, but some may be Days with no Irish connection. There are very few instances of perfect correlation between surnames and Y-DNA, except perhaps the Marrinans (281 in 1911).